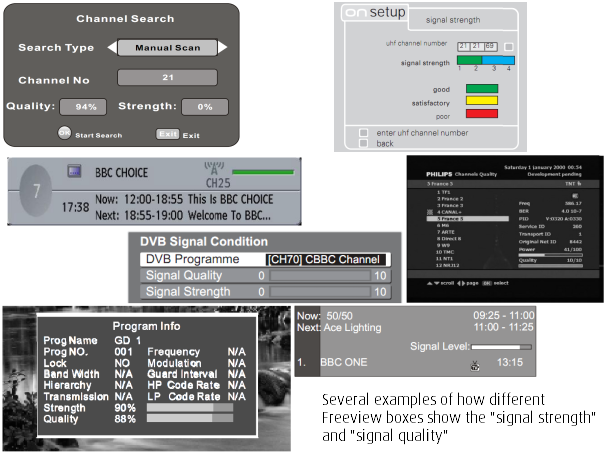 If you have a high-gain aerial or use signal amplifiers, it is quite common to find that the high-power digital signals provided after switchover will overload your Freeview equipment - and can appear to be "weak signals". Most people will experience nothing but simplicity and joy with the digital switchover - the process that turns off the old five high power analogue signals, and the existing six low power digital services and replaces them with six new high power Freeview multiplexes. For those with problems, there are generally three issues. It is also common that people do not clear out the old channel list (by selecting "first time installation" retune, "Factory Reset" or "Shipping Condition") before doing an "autoscan" for the available broadcast frequencies, and this results in everything from missing channels to no subtitles, programme guide, wrong channel numbers and no text services. If you can't find how to do it see either Freeview Retune - list of manuals or do it this way: My Freeview box has no EPG, is blank, has no sound or the channel line up is wrong . A third problem is caused by having signals from more than one transmitter - see Digital Region Overlap. The final very common issue is "too much signal". At most transmitters, the digital signals after switchover are considerably more powerful than before. This was because when the analogue and digital services ran together, the digital services were kept low to prevent appearing as snowy interference on television sets using analogue reception. 4,000kW of analogue signals are turned off, and the digital services increase in total power from 48kW to 1,200kW - that is an increase of 25 times in numerical terms, also know as +14dB. (The reduction of -7dB from the analogue strength is intended - the digital services require less power to cover the same number of homes). This large increase in power should cause no effect for most people. A stronger signal does not increase the picture quality (you need Freeview HD for that), sound levels - the only effect should be that more homes that are further away from the transmitter mast can receive a stable digital signal. However, many people have been tempted into buying one both high gain aerials and signal boosters. High-gain aerials were very suitable for places where the Freeview signal before switchover was very weak indeed, but if you have one of these and you are located closer to the transmitter, you will probably now have a signal overload. Generally speaking, signal booster devices are never really much use for Freeview reception, and much of the time they actually amplify the interference more than they do the signal, causing reception to get worse, not better. One is signal strength - this shows the power level of the signal entering the Freeview box. Often "0" is the lowest and "10" the highest, but sometimes it can be a percentage, sometimes coloured boxes and so on. The signal strength should be around 75% - more than this indicates too much signal. The other measure is the signal quality and this is much more important to high-quality Freeview viewing. Any measures that increase this to the maximum will provide for uninterrupted viewing, lower values will result in "bit errors" that cause the picture to freeze and the sound to mute out. One problem with over powerful signals is the overload can sometimes show as a low signal because the receiver circuitry will enter a "blown fuse" state to protect itself. First, if you have a booster or amplifier - remove it from your system. Don't just unplug the power, as this will result in no signal getting though the device. If you can't just disconnect the output cable and connect it to the input cable, you might need a coax female-female coupler to connect two male connectors together. If you don't have a booster or amplifier, you might have to fit an attenuator onto the cable. They come in two types, either a "single attenuator", around five pounds, or a variable attenuator, for around ten pounds. The variable sort has a knob that can be turned to select the required level of signal dampening. Hi I have a tv signal of 94% and quality 100% since recent retune at Craigkelly transmitter which causes pixelation problems on occasion. Can you tell me what attenuator I.e. 2db 4db 6db etc. I woulld require to achieve an acceptable signal. You should try a 3dB one first and if that is not sufficient then try a 6dB one. I'm not a fan of the variable types as they seem to be uncertain quality. Our problem..We have two TV's so fitted a 2 way splitter "F" type. Worked fine but then today main TV has "no signal so I " Unscrewed "F" connector and when the copper cable touched the outer case of splitter TV had signal 50%+ strength and 100% quality but as soon as I connect it back I lose signal. Is it a faulty splitter ? It may be but there are things to check first. Start by checking that the F connectors are all fitted correctly and that there are no stray filaments of the outer touching the inner conductor. Do that check on all the connectors. Then use an F coupler to join the aerial feed cable to just one of the TV feed cables and check the signal strength for all multiplexes on that TV. Then do the check connected to the other TV without the splitter. I that all works, then connect both TVs again using the splitter - ensuring that all the connections are perfect again. Then check both TVs. If all is working then the problem was oxidation on the contacts - it happens more often than people realise. If all is not working then it is likely to be a fault in the splitter. Make sure you never try to use the splitter with just one outlet connected - they are designed to have all outlets in use to ensure there is the correct impedance matching. Let us know how you get on, please?